You are currently browsing the category archive for the ‘Voluntary Simplicity’ category. 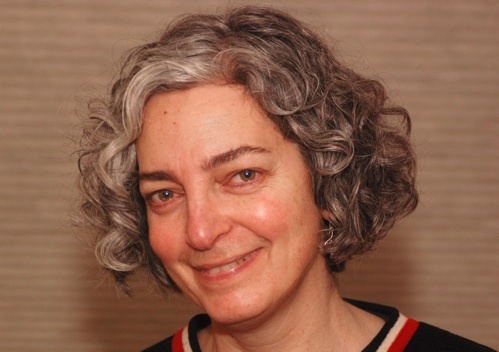 This week we are happy to share a guest post from Mary Shaw who works at the Ashland, Oregon Food Co-op, where participants recently completed NWEI’s Voluntary Simplicity discussion course. Participants shared a variety of reflections upon completion of the course, with one participant noting “I am thinking more deeply and intentionally. It’s helping me be accountable to get rid of things I’m no longer using.” Another course participant mentioned that “the Voluntary Simplicity group has prompted me to consider and eliminate internal and external clutter in my life…When making purchases I now ask myself is this a need or a want?” Thanks to the Ashland Food Co-op for sharing these reflections with us! Simplicity can be viewed as a practice to create a more purposeful way of life in a complex, consumptive society. To simplify is to reduce what you have to the essentials; to streamline and to clarify. Participants in the Co-op’s first offering of the Voluntary Simplicity discussion course are making life changes one step at a time. Weekly readings and discussions are followed by an action plan which helps participants commit to change. For example, one of the action plans with the theme “Intentional Living” prompted some participants to do the following: cook 5 good meals during the week; check email only three times a day instead of every 30 minutes; and take regular walks. Part of each session is then spent sharing the successes, challenges, and inspiration experienced while implementing these commitments. Some of the participants will be starting a new group in April. If you are interested in joining them, contact Mary Shaw at 541-482-2237 ex 261. The Ashland, Oregon Food Co-op‘s Voluntary Simplicity Team is hosting NWEI’s Voluntary Simplicity course in the Co-op Community Classroom. The response from the community was double what was expected! The course began just last week on January 23rd and will run through March 13th. Last week, group participants explored the Meaning of Simplicity, and will consider Living More with Less during tonight’s meeting. Thanks to the Co-op’s Voluntary Simplicity Team for hosting: Mary Shaw, Education Coordinator, Stuart Green, Sustainability Committee Chair, Pam Lucas and Deborah Theos, who are with the Outreach Board Committee. While this is the first Northwest Earth Institute course offered by the Co-op, the team plans to offer the NWEI discussion courses seasonally going forward. As the Advent season approaches, more people are suffering from affluenza than influenza from the cold weather. The act of giving during Christmas is often undermined by this illness. Many would suggest that this condition is caused by American consumerism and the expectation of numerous material gifts on Christmas day. How can we avoid this? What is the prescribed vaccine for affluenza? It’s simple. Originally, I found this definition in a curriculum about Voluntary Simplicity that I experienced with a small group this summer. It was no surprise to me that a correlation was made between living simply and consumption. However, after my group finished the curriculum, I found that limiting my amount of consumption did not easily equate to a simple life. Instead, committing to living simply has created a lifestyle that requires concentration and effort – far from simple. Voluntary simplicity isn’t merely spending less; rather it is a concerted effort in exploring why we consume in the first place. This week we are highlighting a blog excerpt from a Voluntary Simplicity course participant in upstate New York. 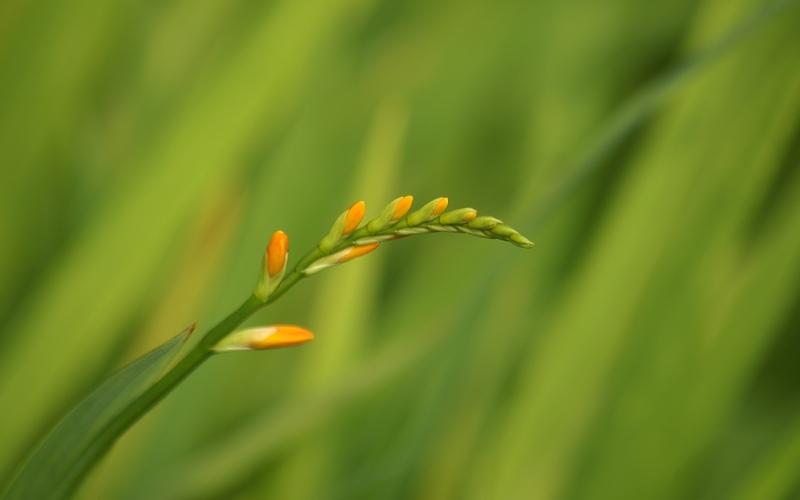 Erika writes about her experience with he Voluntary Simplicity discussion course on her blog: Eat. Make. Do: Our DIY Life. Enjoy! 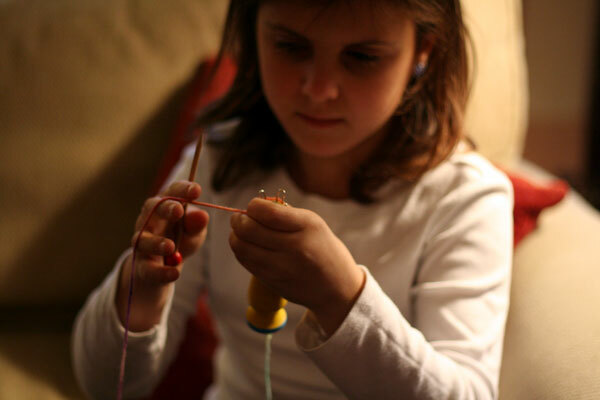 Recently I joined a discussion group on Voluntary Simplicity organized by Jillian…Week Three’s topic was work. Just in our small group I realized that I am in a minority (I think) when it comes to how I view satisfying work. To me work is very physical. If I’m not manipulating things it doesn’t seem very gratifying. This holiday season, NWEI invites you to consider Voluntary Simplicity as you navigate the choices and events of the season. If you haven’t yet, consider forming a Voluntary Simplicity discussion group and gather with friends, family or co-workers to consider alternatives to the busy, consumer-focused pressures often accompanying this time of year. Also, consider giving the gift of learning by sharing NWEI course books with family and friends. NWEI is happy to send the book or books of your choice to the recipient(s) on your gift list. If NWEI has impacted you, we invite you to share the gift of these resources with others. You might also consider giving the gift of a Gift Membership package, which includes the course book of your choice along with an annual membership to NWEI. This option is available online at www.nwei.org/donation. (*Please scroll down to the last option in the cart). However you choose to spend your December, we wish you peace this season! The holiday season is upon us again. On the one hand, there are family traditions, favorite holiday songs and time spent with friends and family. Alternately, there is the pressure to bestow gifts upon friends and family, commercial pressure, busy stores and holiday crowds to contend with (not to mention the myriad food choices, many of which are not sustainable!). “No time of the year is more emotional than the holiday season, whether you’re bursting with the joy of baking and caroling or overwhelmed with the stress of shopping and wrapping. But even with all those other factors weighing on your mind, it’s possible to put a green spin on your holidays; simple tips and easy substitutions mean you can come through this season of indulgence without leaving a massive carbon footprint. Start with your gift list, where going green can mean anything from simply buying fewer gifts (the too-cluttered shelves at your giftee’s house will thank you, we promise) to finding Fair Trade alternatives to holiday classics. Look for recycled paper goods, like cards and wrapping, or get creative and make your own versions of both. Green your Christmas dinner with seasonal, local ingredients and organic turkeys, and stock your bar with organic bubbly and other green cocktails. Then look for green greens for your home by choosing fresh wreaths and pesticide-free trees trimmed with energy-slashing LED lights. Put the money you saved on your electric bill toward a donation to environmental charities and let your greenbacks support green projects. 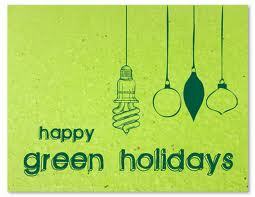 For more ideas on greening this holiday season, click here. Also, keep in mind that NWEI offers gift memberships, as you embark on your simplified holidays season. Jeff and I are participating in a discussion class about Voluntary Simplicity…We meet every Sunday afternoon for an hour. I love the format of the discussion courses – they are a few weeks long; there are short, meaningful readings each week; and there are relevant questions for us to ponder and discuss. Voluntary Simplicity is the name of the course. I think of it more as Voluntary Intentional Living. Nothing is simple. Some things are intentional. All things considered, we do live a simple life. But there is always more to be done, isn’t there? I have a few things to do in the kitchen to simplify a bit more. I need to do a better job of re-purposing containers, re-purposing left overs, and choosing ingredients that have a smaller footprint, both carbon and egotistical. I got out of practice during our move, and I haven’t gotten back into the habit since. Less plastic hitting the recycling bin, more reusable cloth bags for the bulk bins. Less tea from the store, more tea from our garden. Less wine with dinner, more water from our well. Less coffee and oil from places far away. More vegetables from close to home. …But, by and large, we are happy and satisfied. We are living life the way we want. We make our own rules. Our own schedule. Our own To Do List. Our own priorities. We are truly living. Arizona Hosts Its First Voluntary Simplicity Course! Grace Wilson-Woods of Sun Lakes, Arizona recently convened Arizona’s first Voluntary Simplicity course. She took the time to write some reflections about the experience, shared below. Thank you, Grace! “The NWEI North American Gathering Conference was coming up September 15-18th in Port Townsend, Washington and I was excited to go. The Hans Hoffman statement on the cover of the Voluntary Simplicity course book touched me deeply: “The ability to simplify means to eliminate the unnecessary so that the necessary may speak.” I knew I needed to simplify my life. Once back in Sun Lakes, Arizona, I along with 8 other family members participated in the NWEI Eco-Challenge from October 1-15th. This increased my motivation to immediately form a discussion group. I decided to invite ladies from my church (Seventh-Day Adventist), ladies from Church of God in Christ(COGIC) and ladies from Community Church of New Thought. I purposely selected 10 ladies from different religious denominations to make sure we had a variety of views in our discussion. Also to prove that voluntary simplicity has no boundaries. The first article “Living Deeply” resonated with me immediately and I was convinced to begin living a simpler life. Some of the things I plan to focus on as a result of the course include: Have a zero balance on my credit cards; Shed excess clutter and clothing (donate to homeless shelter, etc. ); Select organic produce as often as possible and buy smaller amounts to prevent waste; Become self-sufficient in the basics of life such as growing more food in my garden- move from gardening as a hobby to a sustainable food source; Buy local by ordering a “farm box” twice a month; I also plan to decrease spending – buy only what I need, not everything I think I want. Thanks to Grace for organizing her group – and to the 10 ladies to joined her weekly for discussion and tea around the theme of simplicity! Northwest Earth Institute courses have been used in the business community and at workplaces of all kinds since our founding in 1993. In fact, the first discussion course to take place was in a law office, setting the template for thousands of organizations to follow in gathering employees to discuss pressing environmental and social responsibility concerns. As the former Director of Business Partnerships for NWEI, I was particularly excited to find a communications blog, Change Conversations, where blogger Sally Kieny wrote about how NWEI’s discussion course on Voluntary Simplicity prompted a business group to reflect on how our written and verbal communications can be simplified through getting back to basics. Read below for Sally’s reflections and find the full post here. 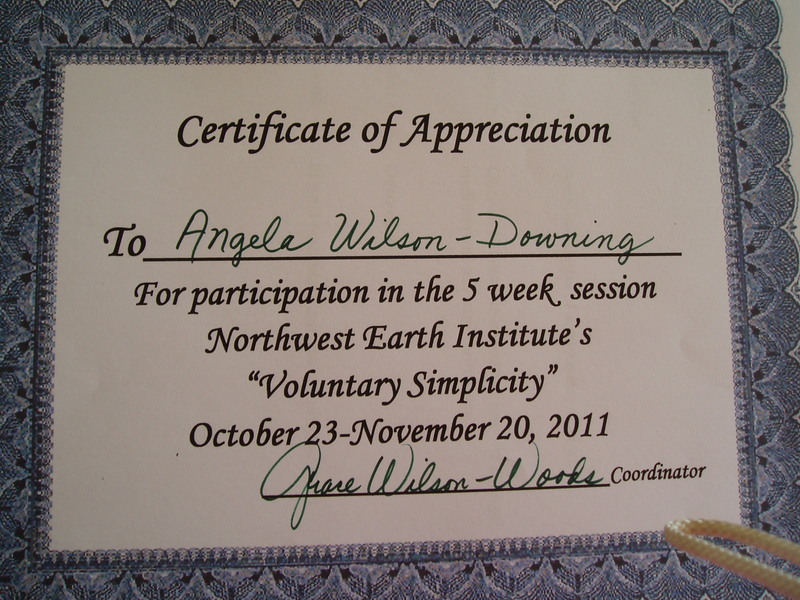 Recently I signed up for a discussion course entitled Voluntary Simplicity, offered by the Northwest Earth Institute. I wasn’t quite sure what to expect, but was intrigued at the thought of bringing more simplicity into my life. Immediately I was conjuring up ideas of clean and organized closets, a streamlined home office and less stuff in my life. And while I hope to reach that level of uber-organization in my personal life, I’ve also come to realize that this concept offers much for the marketing-communications world. Simplifying and Getting Back to Basics: We use a tool called a positioning worksheet to help our clients bring focus to their marketing activities and determine how they want to be perceived in the marketplace. Through a series of work sessions, we work with our clients to develop a statement that identifies the business they are in, the specific needs of their customers, who their competitors are and the unique benefits of our clients’ products or services. Using this statement, we are then able to evaluate all potential marketing activities (advertising, sponsorships, PR activities, etc.) to determine if a particular activity would support—or detract from—the client’s positioning. This tool simplifies and brings a clear focus to their marketing activities. So the next time you find yourself weighing various advertising options or determining which trade shows to attend, ask yourself, with your positioning statement in hand: Is this activity taking my business where I want it to go? Will it meet the needs of my customers? Is this activity “on position” for us? If you can’t answer “yes,” then ditch the activity and move on. The bottom line: Simplicity can be a wonderful thing in your life and your work. Don’t make things more complicated than they need to be. Don’t try to do too much. 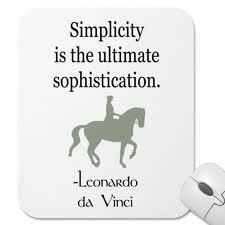 Simplify to bring clarity, to discover what’s important and to be deliberate in your marketing activities. Fitting a Life into 192 Square Feet! This month, Ellen Dawson-Witt is hosting Choices for Sustainable Living in her 192 square food home in Yellow Springs, Ohio. The group is discussing voluntary simplicity, ecology, food and money…and all things pertaining to living more lightly on the Earth. For more photos of Ellen’s ‘tiny house’ and for the full article entitled “Tour of a Tiny House” in the Yellow Springs News, click here. 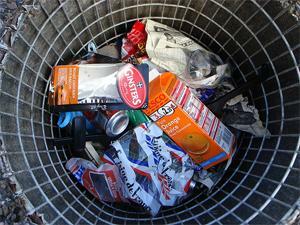 When Ellen Dawson-Witt wanted to live a more sustainable life, she didn’t take half-measures. She moved to a farm, went off the grid, and downsized to a house the size of a shed. Fitting her life into 192 square feet was easy for the 56-year-old — she long ago eschewed television and fashion, and got rid of the stuff she didn’t use — and so was living on a farm in exchange for taking care of goats. 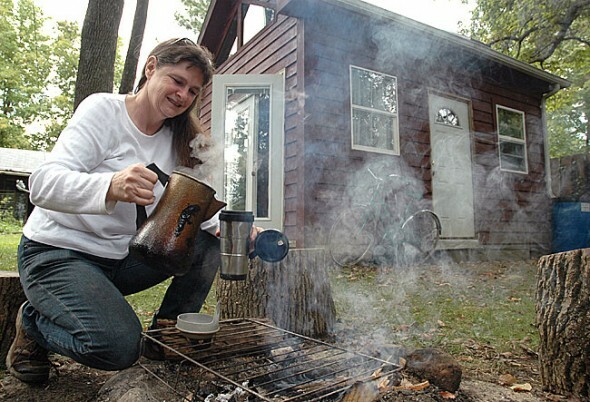 And she didn’t mind carrying water, using a composting toilet, keeping a wood stove going and lighting oil lamps in the off-the-grid structure that lacked indoor plumbing and a furnace. She raised some of her food, carried the water she used for bathing and cooking from a nearby well, collected rainwater from her roof for washing, composted her waste and split wood for her wood stove. There were some modern amenities too — three solar panels, which provided some electricity for a lamp, CD player and laptop, and a 1934 gas range for cooking. Thanks to Ellen for setting the example that living this lightly can be done – and for sharing it with others through a Choices group! Continuing along the path of sustainable eating, we turn our attention to the processing and packaging of food. Over the course of the last century, the food we eat has taken on many new forms. Food has shown up in the stores in increasing layers of packaging with more and more energy used to both process and package what we eat. Today’s proposed action is: Consume only unprocessed foods today in order to cut down on the energy used to process and package; and, similar to what you focused on a few weeks ago when we addressed plastics: avoid items that are heavily packaged. The issues surrounding processed foods are two-fold: processed foods are more resource-intensive to manufacture, and they are sold to us in more layers of packaging. Think about a typical frozen dinner, even an organic relatively healthy meal will generally be packaged in plastic and then inside a plastic-coated paper box. In addition to being healthier for you, unprocessed foods are more often available in bulk, which means less packaging (or none if you bring your own containers). Currently, Americans spend 90% of their food budget on processed foods! Today, we propose getting back to basics with the foods we eat–and eating simply, for the health benefits and for the planet!